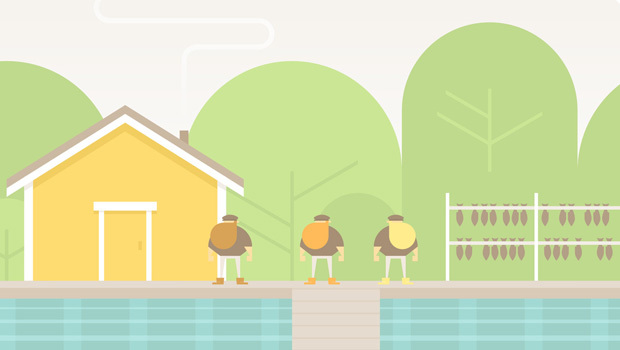 Burly Men at Sea is a picture book in video game form. I don’t mean that it’s a visual novel, in the sense of a mechanics-derived game genre – though I guess it is that, too. Rather, I mean that it quite brilliantly captures the calm, simple sense of wonderment found in the likes of Where the Wild Things Are and the works of Dr Seuss. It’s a game you can play just before going to bed to lull you into a peaceful sleep with dreams full of adventure. It’s a wonderful thing. Based loosely on Scandinavian folklore, Burly Men at Sea follows the adventures of three beardly fishermen: Brave Beard, Hasty Beard, and Steady Beard – as they set off into the unknown seas in search of adventure. Soon after setting sail they’re swallowed, boat and all, by a giant whale, and what happens after that is up to you. On my first adventure, my beards escaped through the whale’s blowhole, found themselves held captive by a masked assailant after losing a race, and then fled into the night when he wasn’t looking, before finally winding up back in the little fishing village I’d departed from. I say “first adventure” because Burly Men at Sea is a game made for repeated playthroughs, each designed to be played in a single sitting. A simple branching narrative structure leads to 12 different possible adventures, each taking half an hour or so to run through. It’s a structure that’s perfect for playing just before going to bed, or to just take a break from the world for a bit and get lost in an adventure. Like I said, it’s a picture book in video game form. The adventures themselves are varied and utterly delightful. You may run into a golem-like giant made of rock who, like a well-meaning dog with no awareness of his surroundings, insists on bringing you “flowers” that are actually uprooted trees. You’ll encounter mermaids, dragons, nymphs, maelstroms, and benevolent seals, among other weird and wonderful creatures. When you get to the end, you’ll find your way back to the village again, ready to set off on a new adventure. Burly Men at Sea elegantly avoids the common visual novel problem of having to skip through scenes you’ve already seen to get to the branches you haven’t followed yet. When you pick a path you’ve taken previously, a more concise and slightly different version of that event will play out. Folks will remember meeting you on previous adventures, too, leading to some lovely, often funny moments. The final piece of Burly Men at Sea’s picture book approach is a gorgeous, minimalist art style. Colours are used sparingly and sprites are simple, but it’s this stylized look that makes the game so expressive and this world feel so full of life.. Topping it all off is a catchy folk soundtrack that, like everything else in the game, is simultaneously soothing and exciting. Burly Men at Sea is a charming, silly, fun, exciting, relaxing choose-your-own-adventure picture book, and that is something quite special. Burly Men at Sea is developed and published by Brain&Brain. It’s available now for PC, iOS, and Android. A press copy was supplied by Brain&Brain for this review.